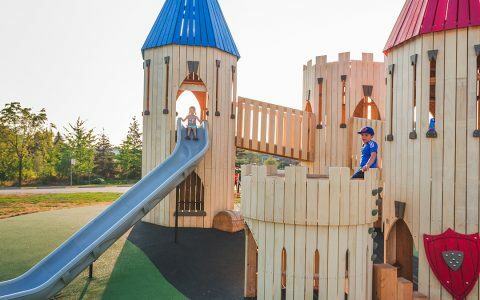 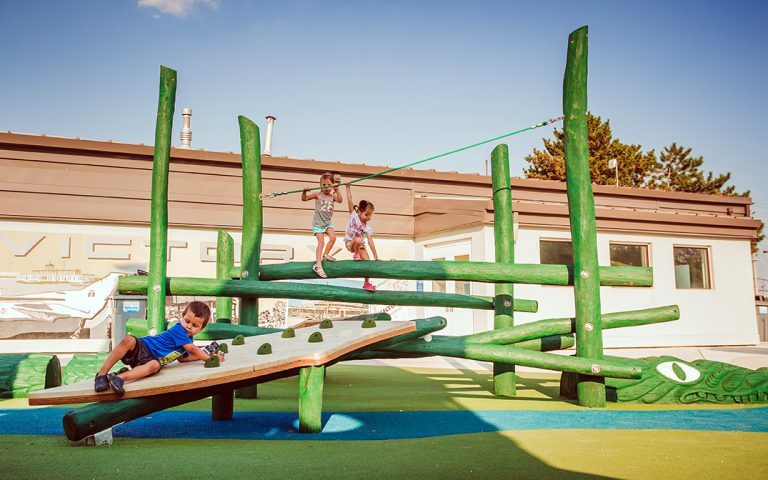 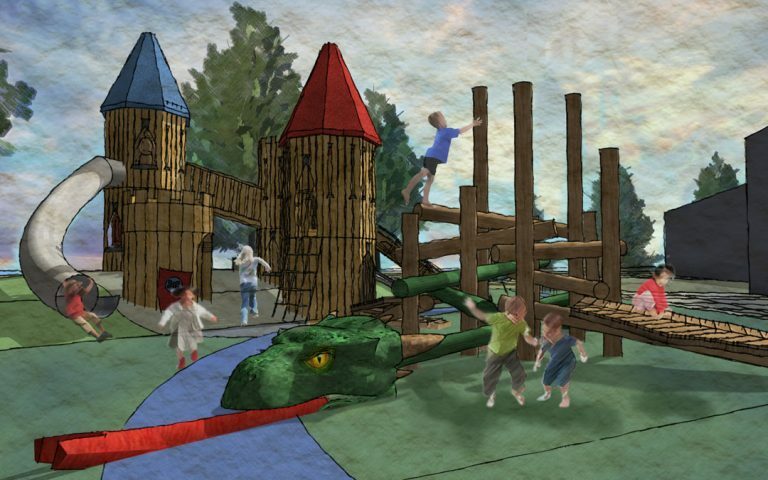 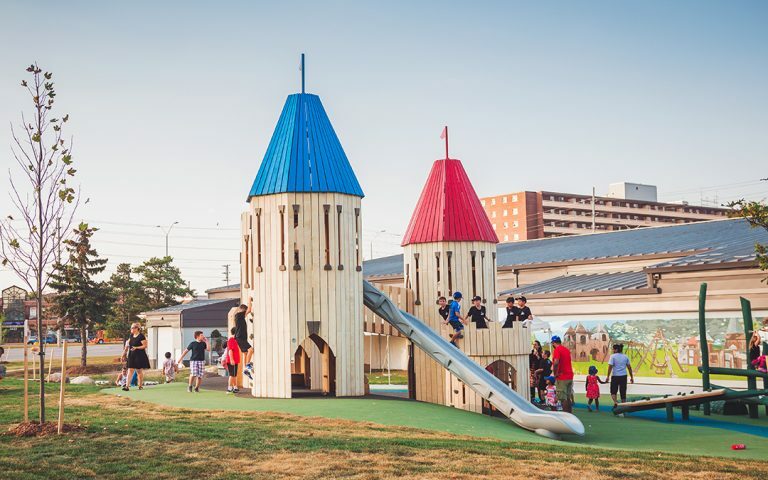 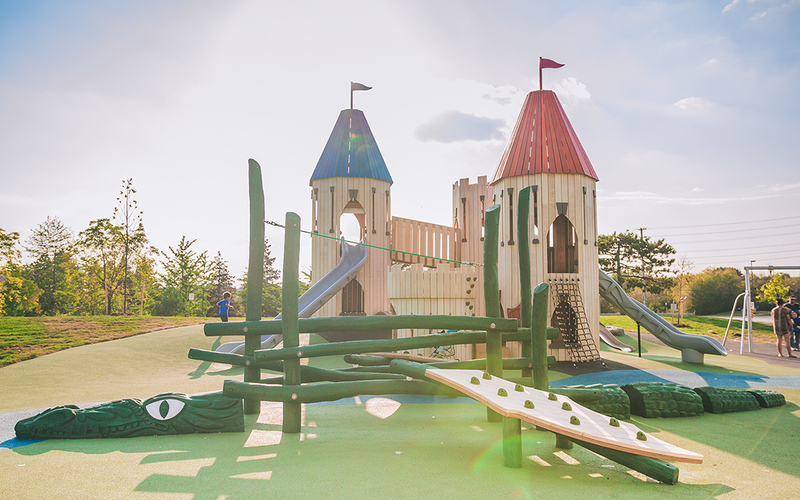 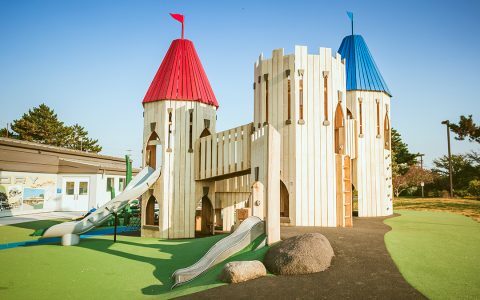 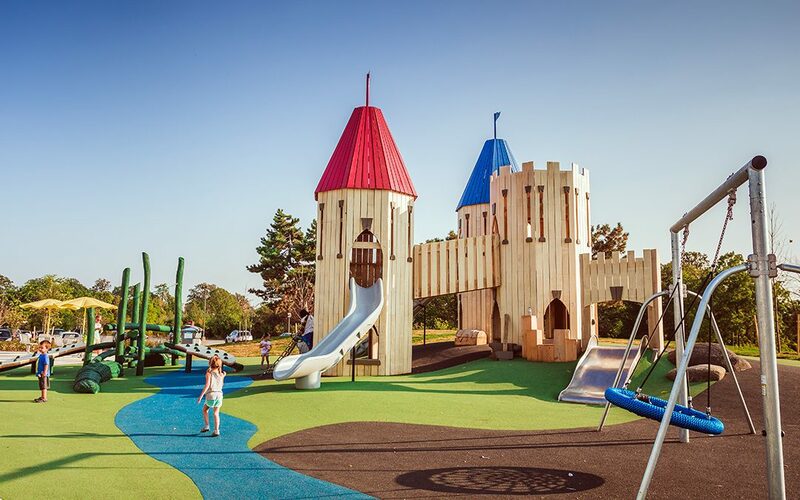 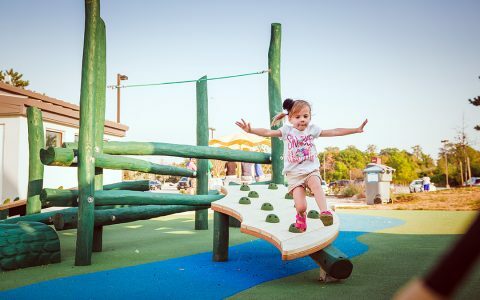 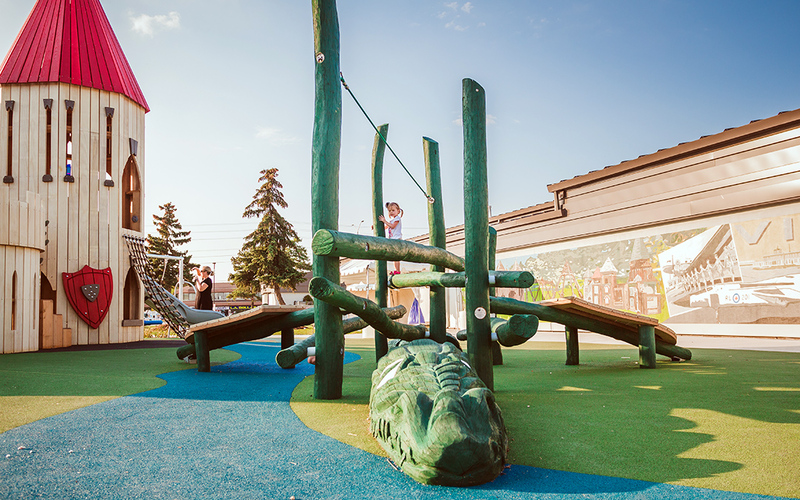 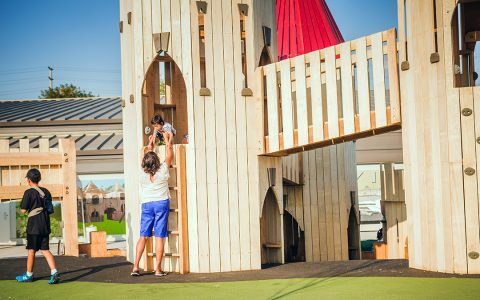 The castle playground design concept is intended to enhance Malton’s sense of place and identity within Mississauga and to provide more opportunities for young people and families to be active, play and socialize. 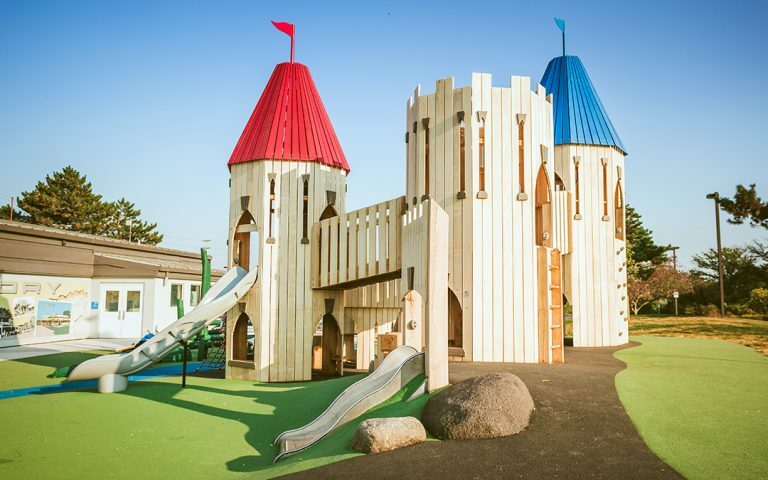 It is inspired by countless classic children’s stories that tell the tales of faraway castles, enchanted princesses, fearless knights and fire-breathing dragons. The fairytale inspired theme creates a memorable space that is an attraction for community members of all ages across the City. Built into a hillside adjacent to Paul Coffey arena are three, four and half metre high towers topped with colourful turrets and flags, which can be easily seen from the street. This large whimsical structure has strategically placed openings and windows for open site lines and to allow the castle to be accessible through multiple points of entry and exit. 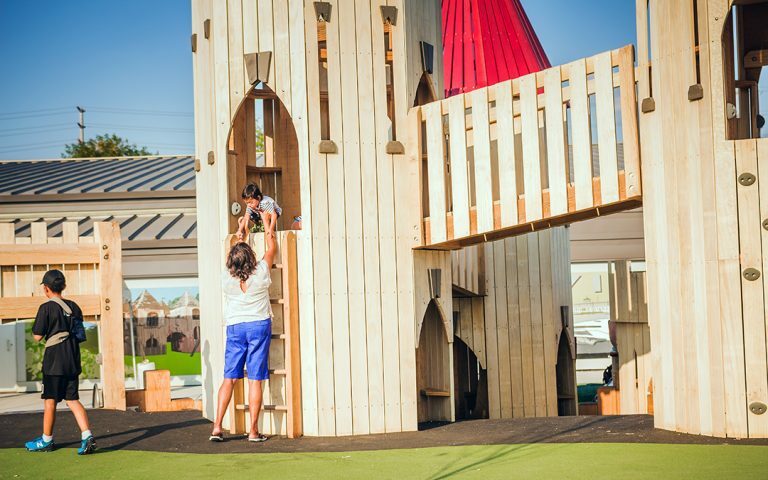 The transparency of the structure is inviting for children of all ages to explore the inner courtyard, traverse up the multiple levels of the towers, and engage their sense of adventure, imagination, and fantasy. 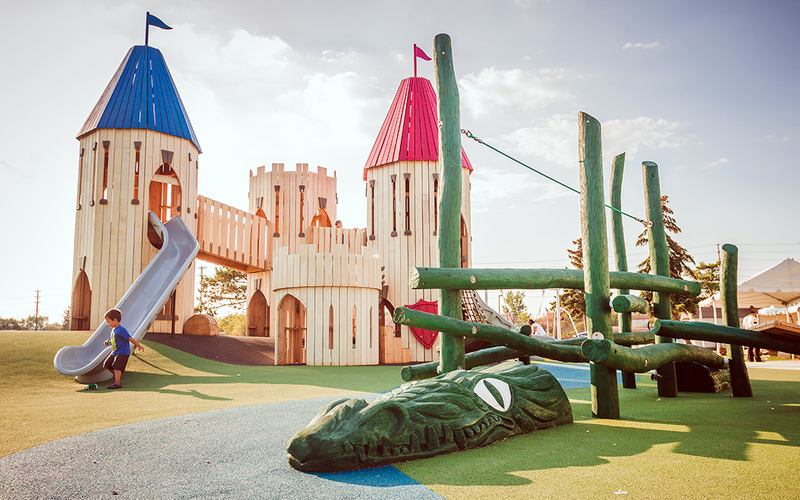 Supporting the castle narrative is a series of large intricately placed logs that abstractly form a giant green dragon. 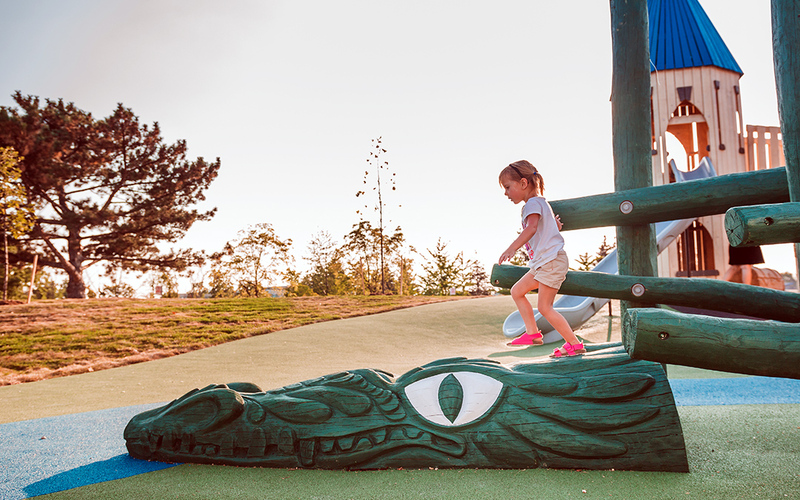 Hand carved by a local chainsaw artist, the dragon head and tail brings the log structure to life as it spreads its climbable wings across the playground. This dragon log jam™ play feature is a challenging element for children of all ages and abilities. 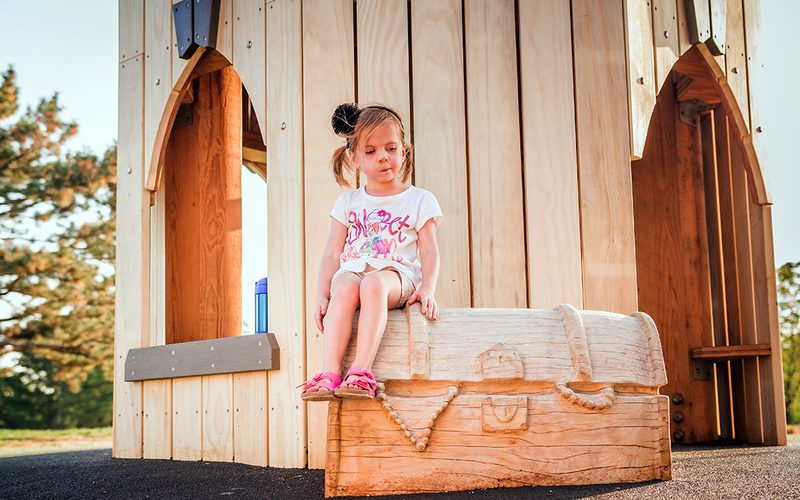 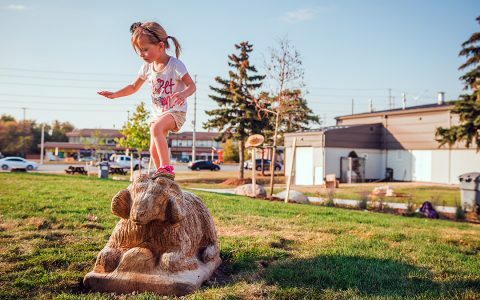 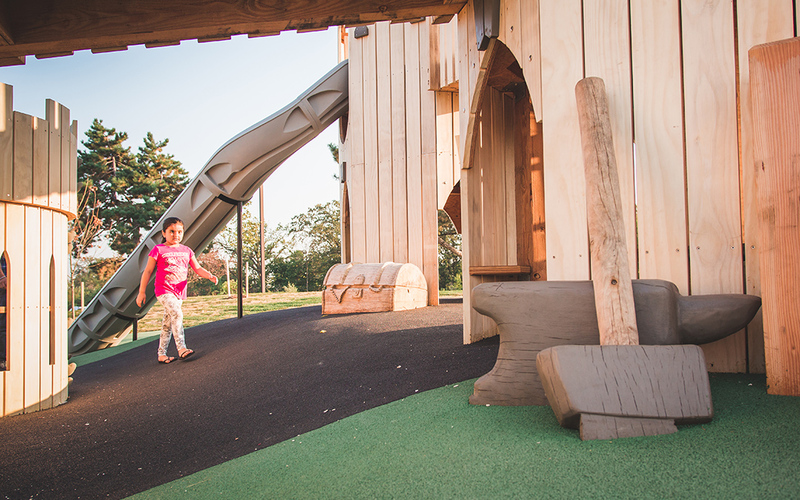 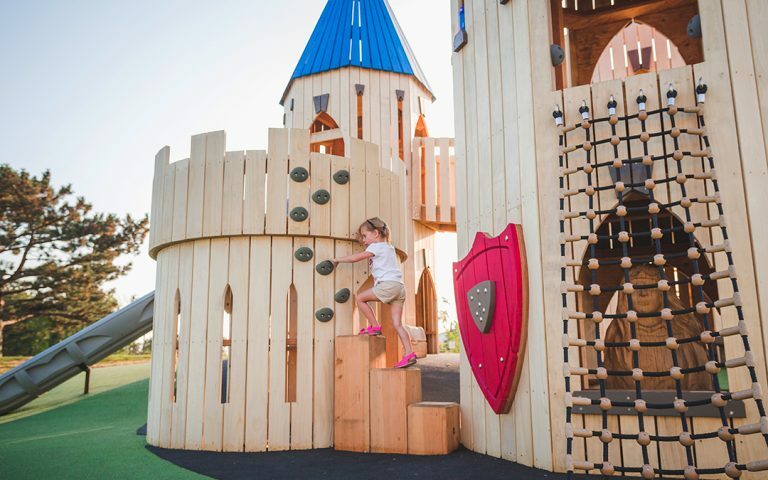 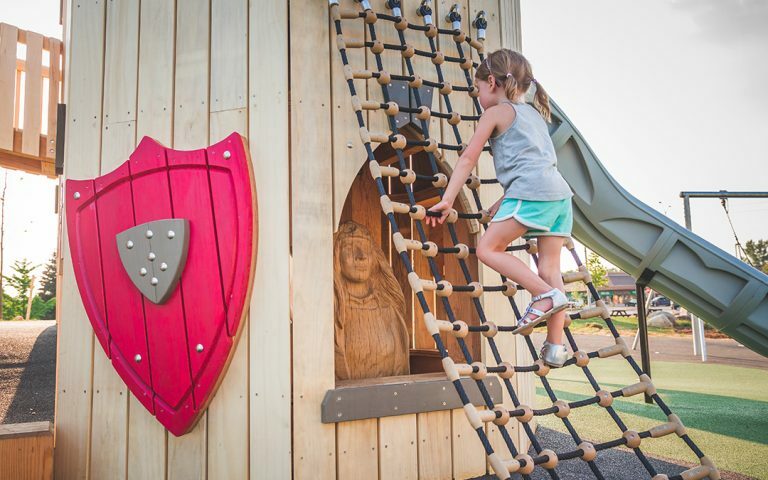 Other hand carved oak sculptures add depth and character to the whimsical playground story – farm animals, a turtle, a princess, wizard and a treasure chest are all found around the site and inside the castle. The thematic public art elements draw children into a narrative, encourage creativity, and provoke the imagination.